My Story card: Heidi Jones remembers coming to see many shows and seeing many famous stars from them. My story of the Mayflower. When I was little my first ever visit is still with me today. I came with my aunite to see Doctor Dolittle with Philip Schofield as the doctor made me laugh. Since then I have come every year to the theatre I have seen Phantom, Les Miserables, Miss Siagon, Wicked, Joseph, every pantomime, dance shows, High School Musical, Leagally Blonde and Avenue Q which is the best adult puppet show in the world. 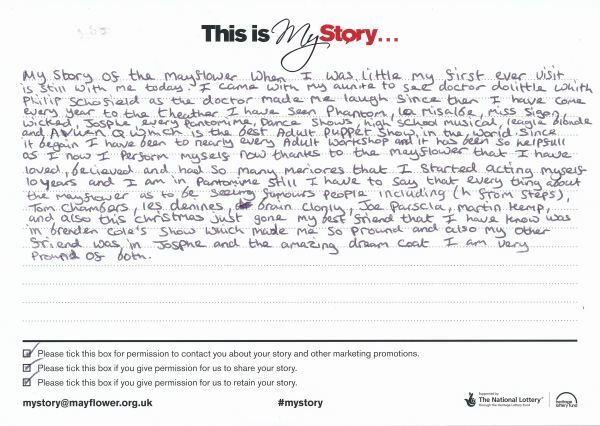 Since it began I have been to nearly every adult workshop and it has been so helpfull as I now I perform myself now thanks to the Mayflower that I have loved, believed and had so many memories that I started acting myself. 10 years and I am in pantomime still I have to say that every thing about the Mayflower as to be seeing famous people including (H from Steps), Tom Chambers, Les Dennis, Brain Conelly, Joe Parscla, Martin Kemp, and also this Christmas just gone my best friend that I have know was in Brendan Cole's show which made me so proud and also my other friend was in Joesph and the amazing dream coat I am very proud of both.